Having people over for Thanksgiving this year? 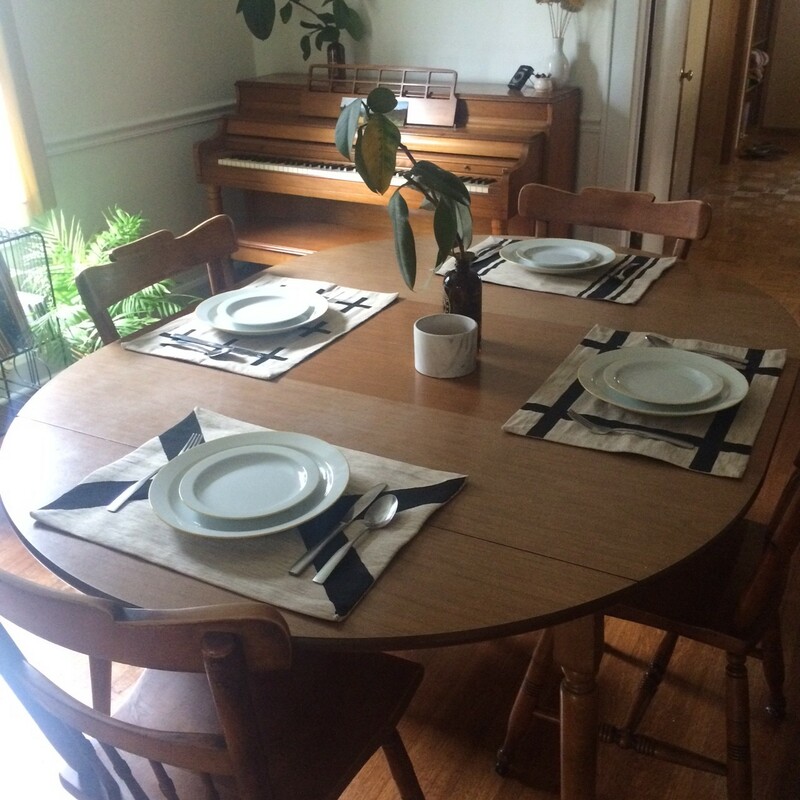 Or, maybe your dining room table is a staging area for crap and you need some inspiration to clear it off and actually eat there…or is that just me? 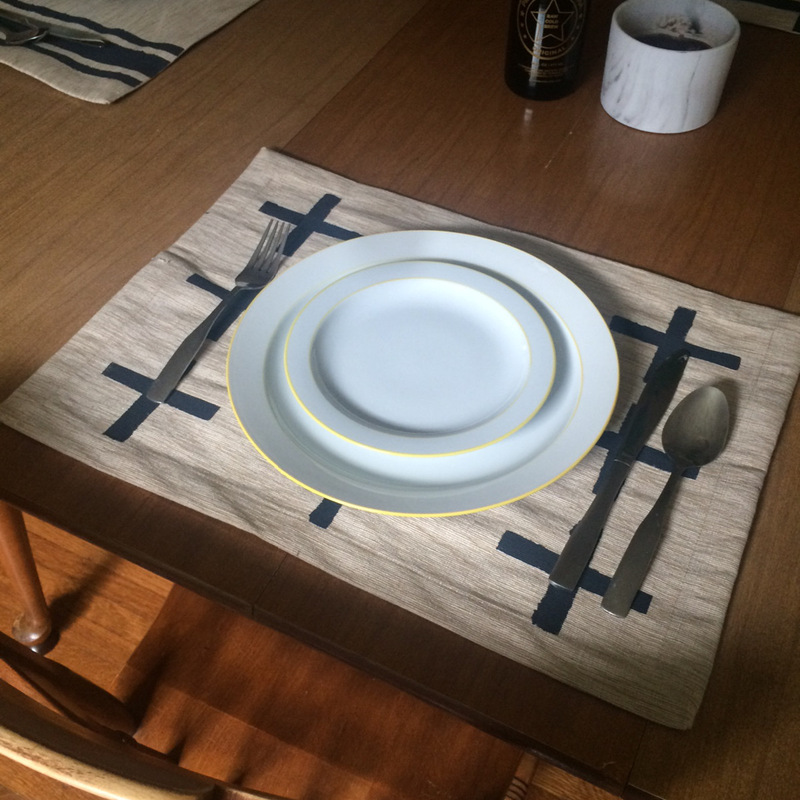 Either way these placemats were fast, easy, and look how cute! Read on as our Events Manager, Rachael, and I get together and make this cuteness happen. First, gather your materials. You’ll need the following. 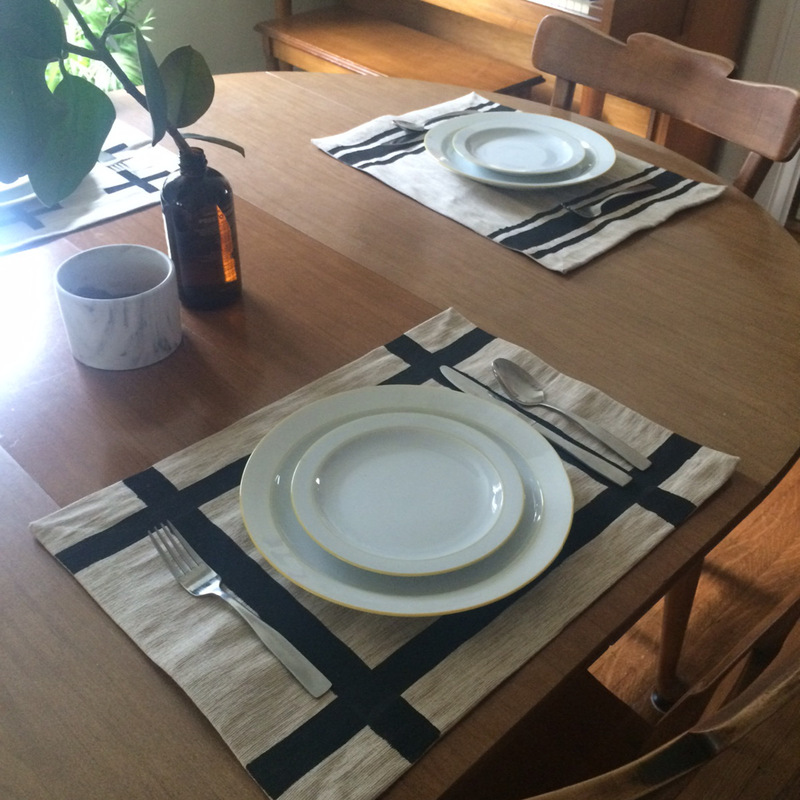 -Place Mats, Rachael found these at Home Goods, 4 for just $9.99. 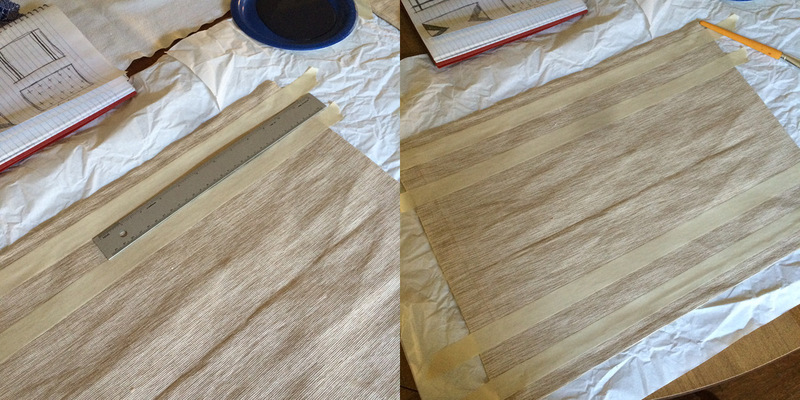 But, if you were just slightly less lazy than me you could cut some squares from any fabric and just hem the edges. 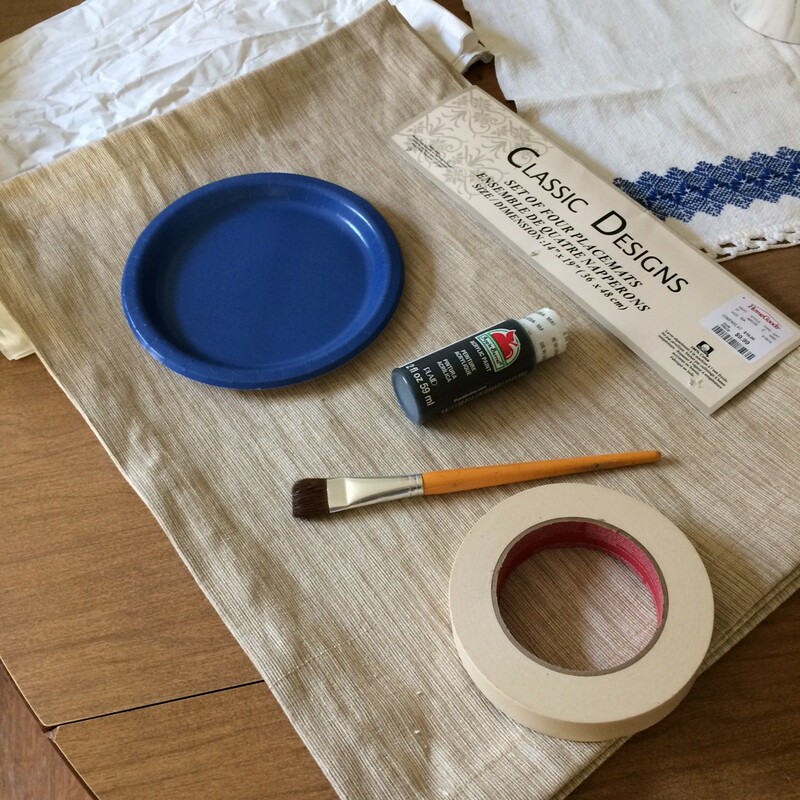 *Technically, you should either use fabric paint or you can add a medium to your acrylic paint to make it a fabric paint. Fabric paints are more flexible and less likely to crack in heat situations like the drier. 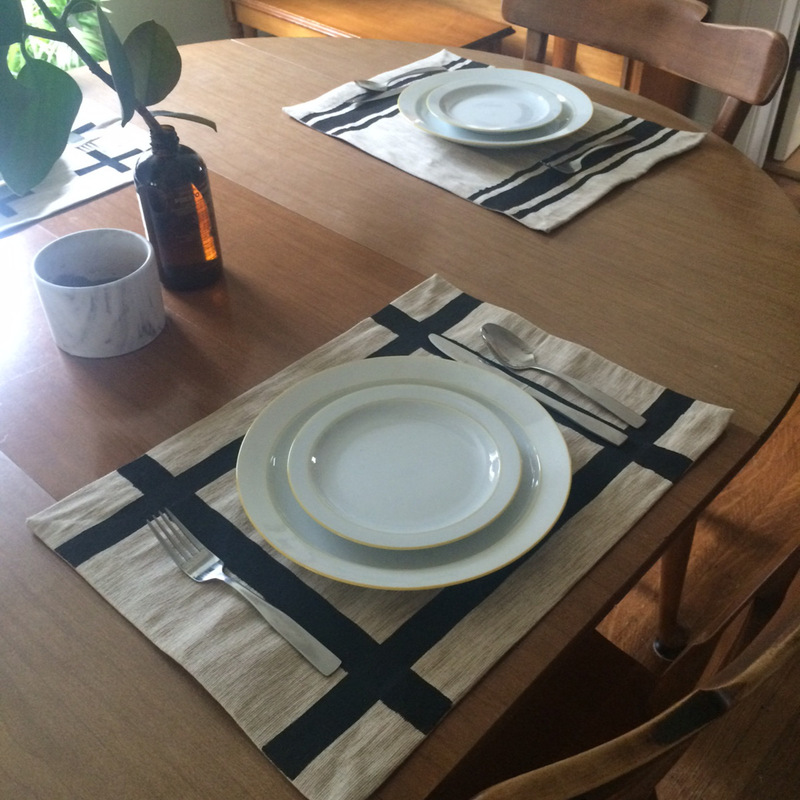 Since place mats don’t need to be flowy and probably won’t be washed all that often unless you’re having toddlers over for dinner, it shouldn’t be that crucial for these. Besides, isn’t that what the kids’ table is for? We’re testing out four different patterns here. You may or may not want yours matching. I’m starting with what I thought would be the easiest (sorry Rachael) which is the bordered pattern. 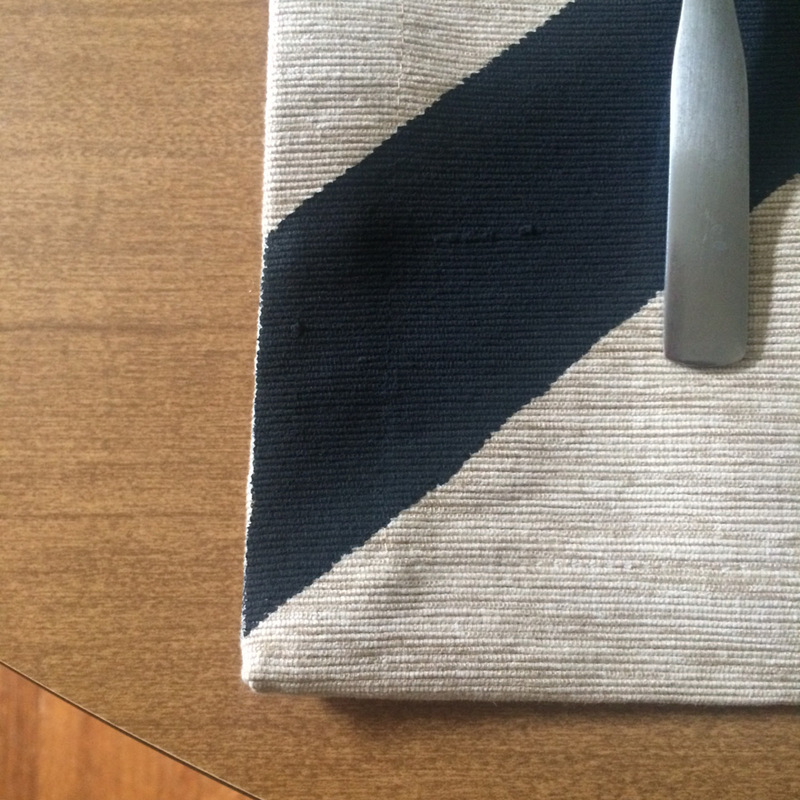 I eyeballed the distance away from the edge of the placemat with help from the mat’s hem, then just used the width of the ruler to guide me. 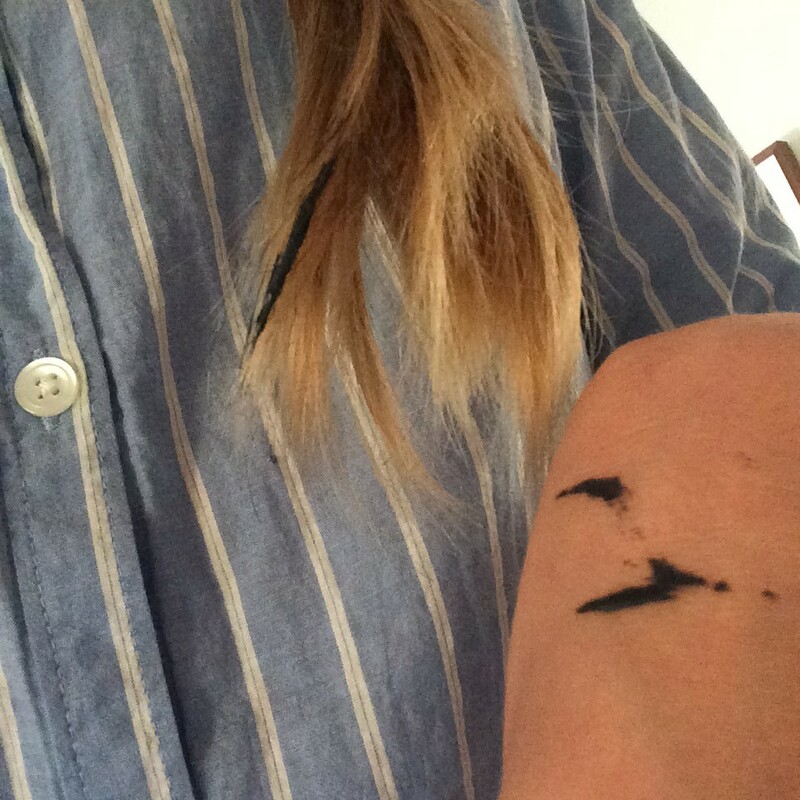 At this point in the project I have already dipped my hair in the paint and transferred it to my arm. Yes, this is the person who is writing a how-to blog. It’s okay. Stay with me. This fabric happens to have a pretty deep texture in it. 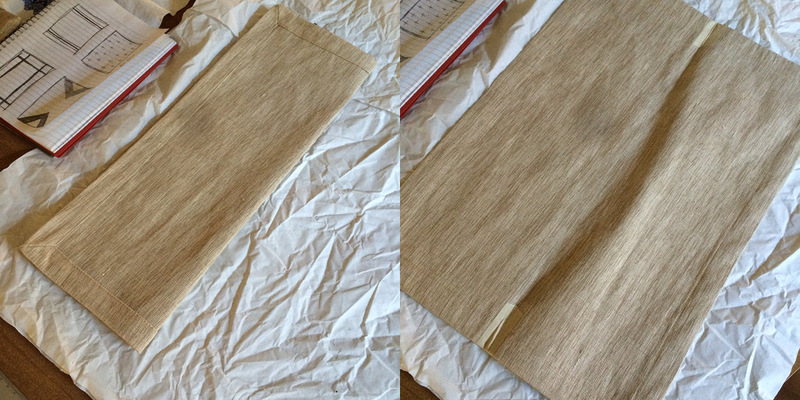 So I really piled on the paint and pushed the brush into the fabric. 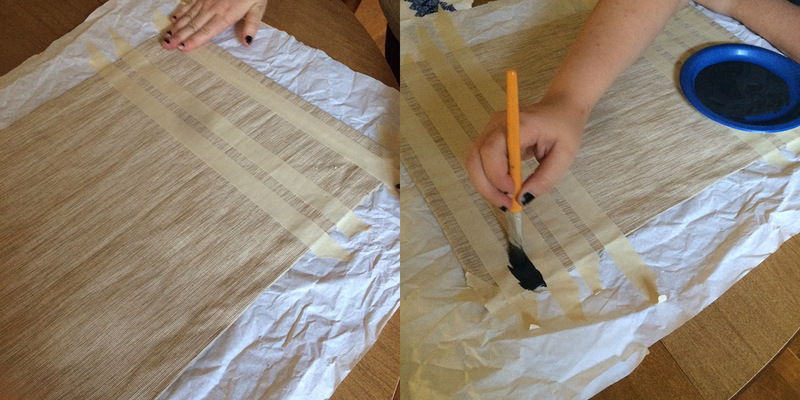 Then, let it dry before adding the tape for the additional stripes. Really it only took 10 or 15 minutes for it to be dry to the touch. Rachael gets to work on the side-striped pattern. 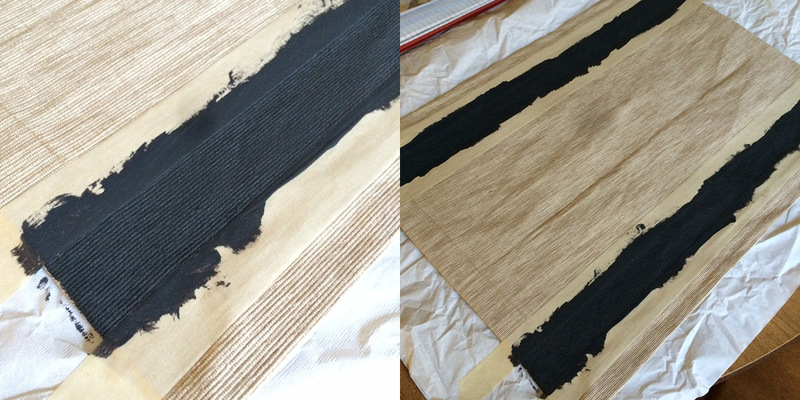 First she laid out the tape for the outer stripes, then let those dry and came back for the inner, thicker stripe. 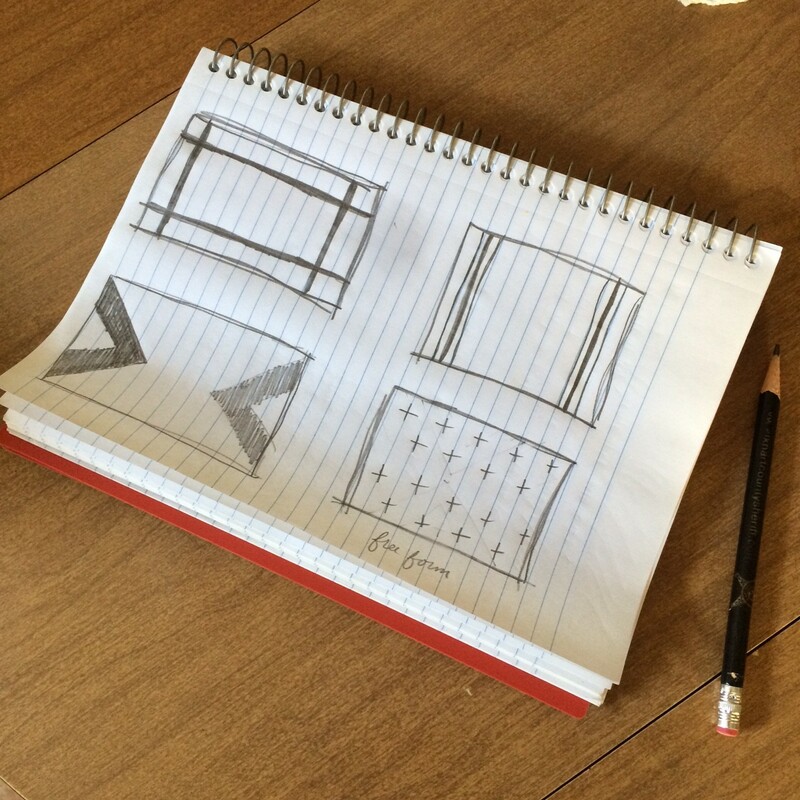 Here we have the beginning stages of the chevron pattern. 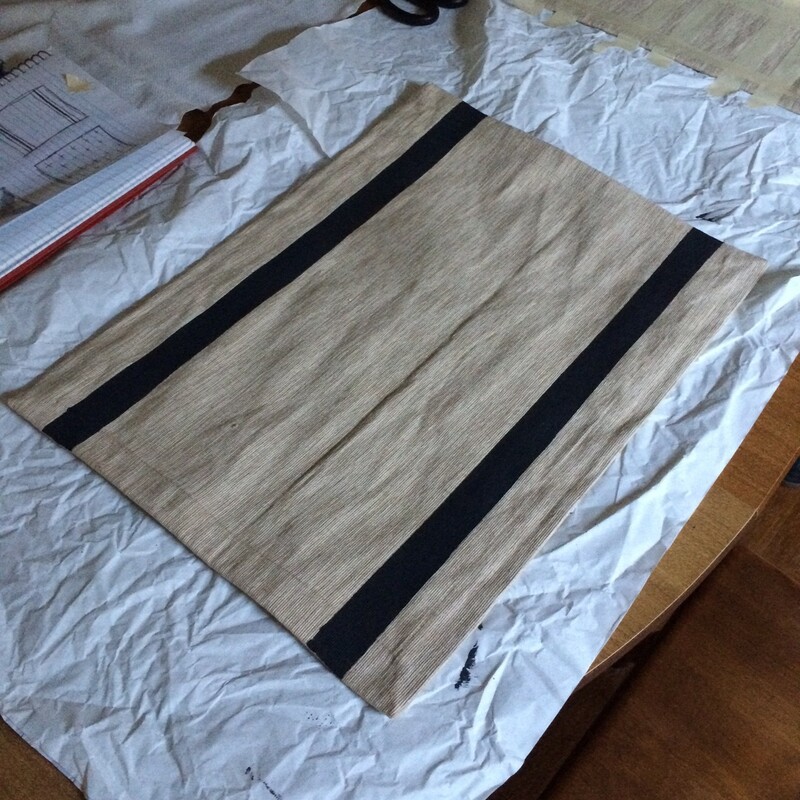 I folded the mat in half to create a light crease in the fabric, then added tape where the crease was and folded it in half again to give a more distinct crease to the tape. Then I marked with pencil where the center was on the tape. Using the center marks, I eyeballed the application of the tape for the chevrons. I am a consummate eyeballer. I am presented with measurements and plans and numbers and then I’m not having fun anymore. And that’s the point, having fun! Plus I’ve convinced myself that imperfections are just little indications of love and not of lack of effort. ‘Cause I’m positive. Above you will find the ingenious way Rachael has laid out the tape to create our plus sign pattern. 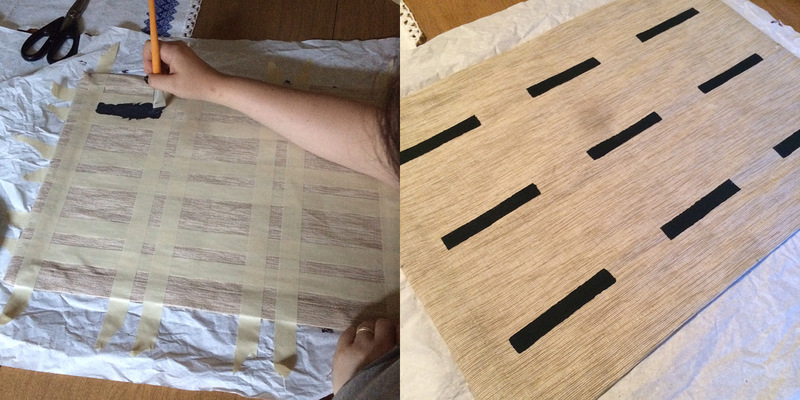 First she paints all the horizontal lines, then re-tapes for the vertical. Originally, as you may have noticed, we planned on this being a free-hand pattern, with marks for the center of each plus-sign and then brushstrokes for the lines. As we began to paint the fabric, however, we decided the heavily textured nature of it was not conducive to a free hand brushstroke. However, this approach is highly encouraged! 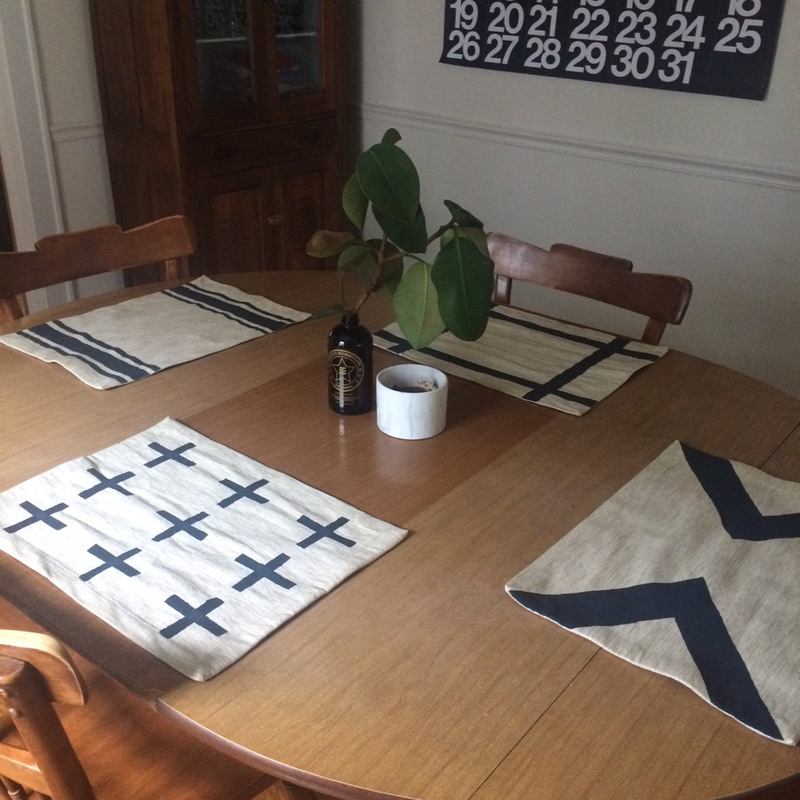 Finish out the designs and let them dry overnight before staging on your table and insta-bragging, er, celebrating your industrious handmade efforts of love and style. If you make these, please share your efforts with us on Facebook, Instagram or Twitter @homespunindy. We’d love to see your handiwork! 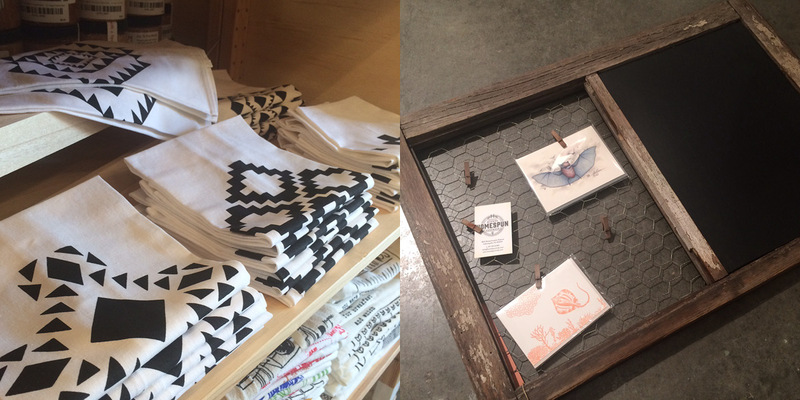 We’ve got lots and lots of new handmade goodies hitting the shelves! Get your hands on the newest products before they start flying off the shelves in a holidaze whirlwind. 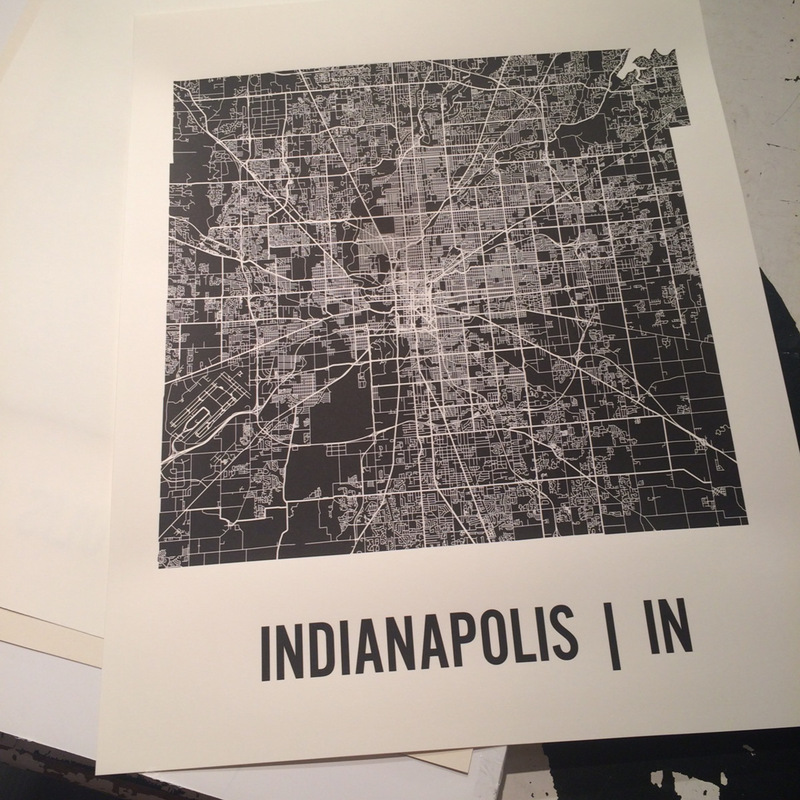 New Indianapolis Infrastructure prints from Mr. City Printing. These are so modern and clean, but intricate too. PUP STUFF. People for Urban Progress brought us a nice restock including some brand new designs. Adorable mug perfect for your Autumn tea-scapades by Farizula Designs, fresh new restock from Wilks & Wilson, and lots of cards from No. 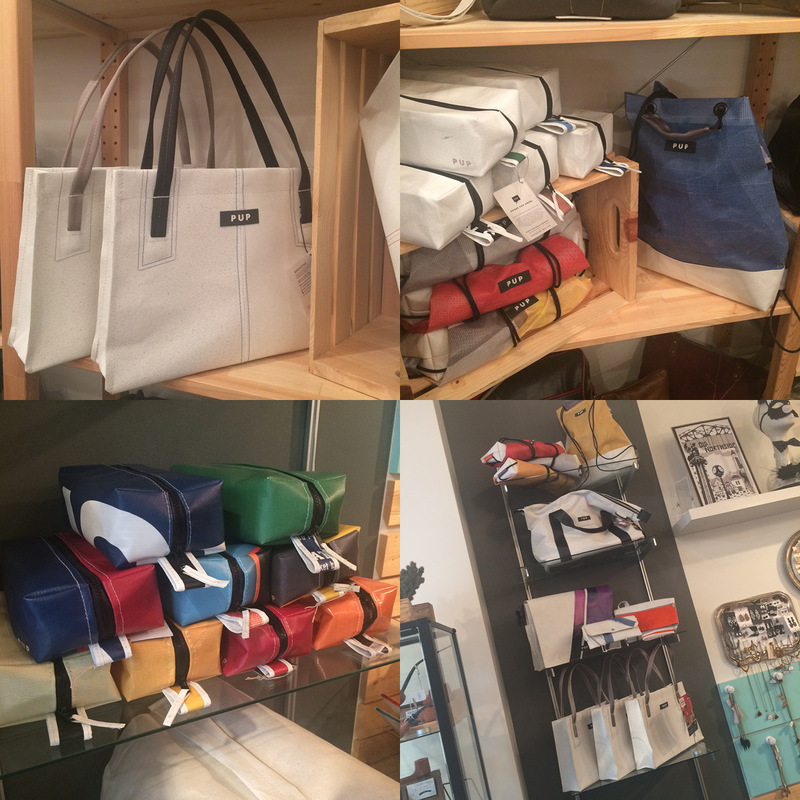 18 Paper Co. 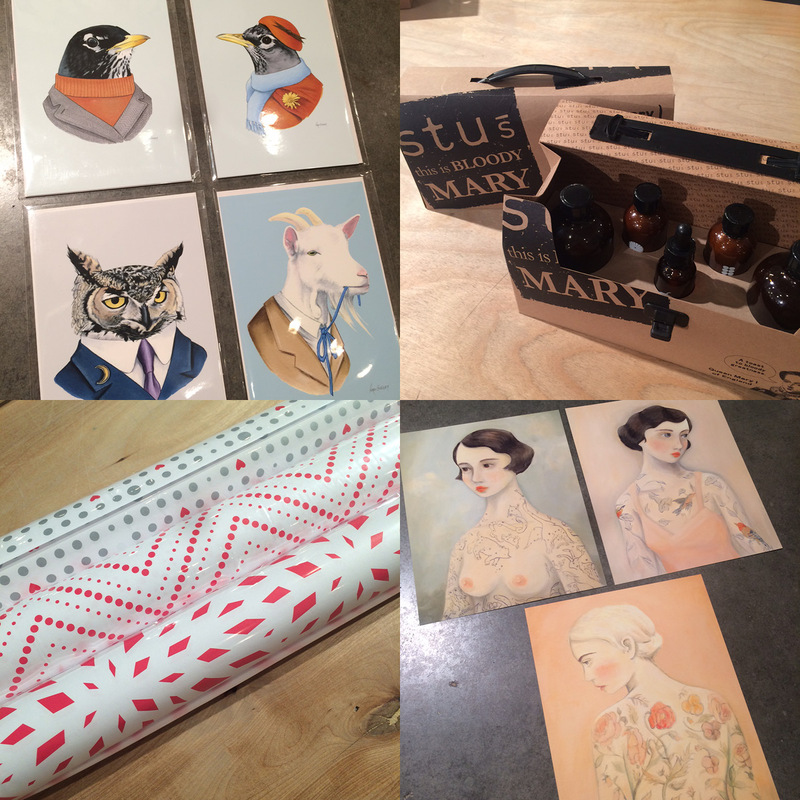 Animals in clothes illustrations by Ryan Berkley, Stu’s Bloody Mary mixology set, wrapping papers by Design with Heart, and beautiful tattooed lady prints (and so many more, including cards) from Black Apple. 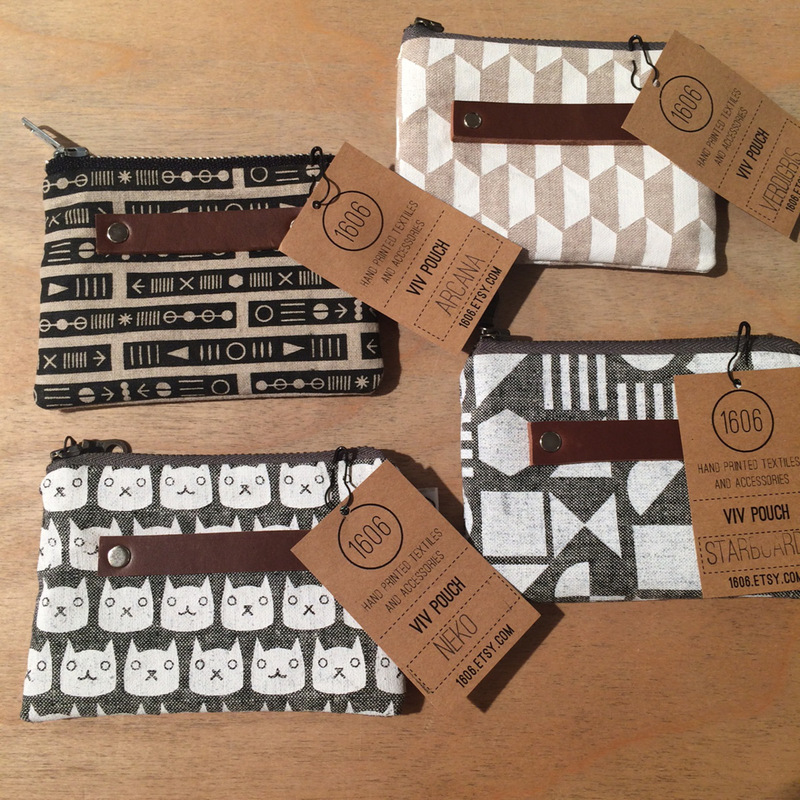 The pouches. They’re addictive. 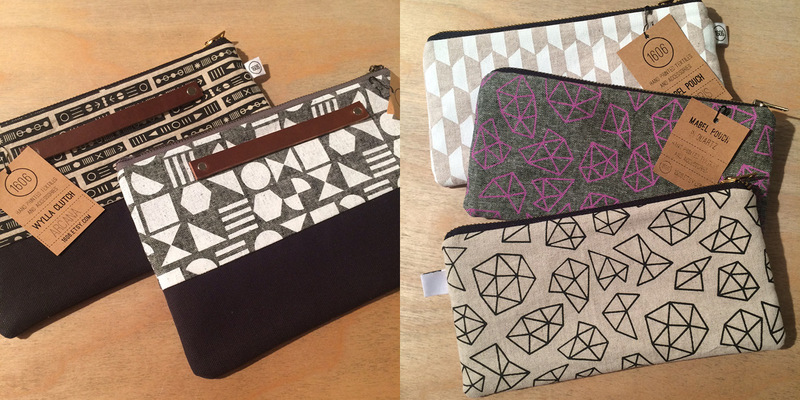 I promise you will find the perfect way to incorporate these adorable zip-pouches into your everyday routine. Plus, cats. New designs and restock from 1606. Now ya’ll know this is my jam. Pumpkin stuff all season long and I’m not ashamed. 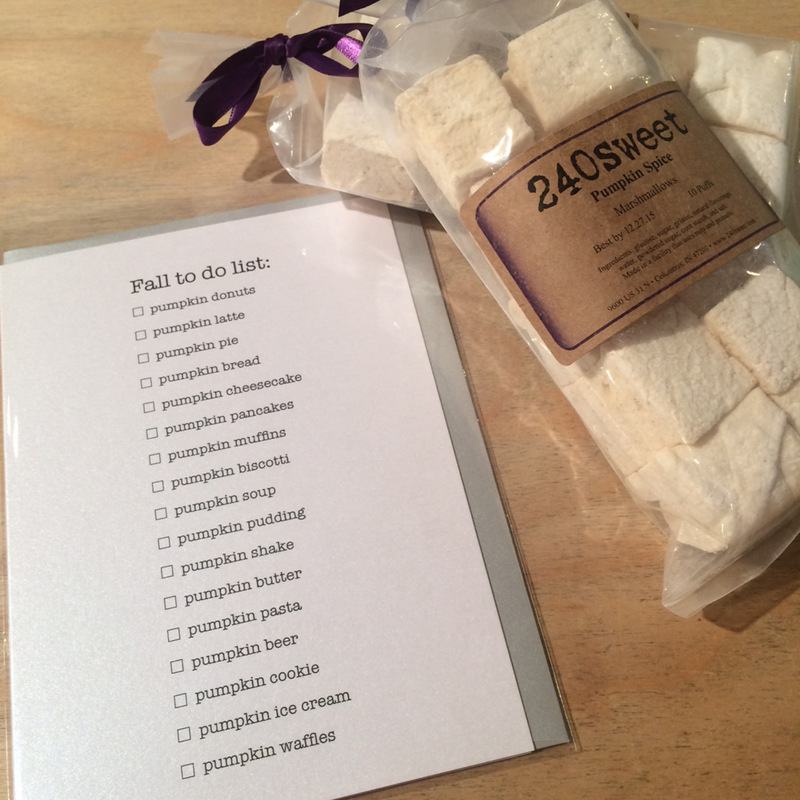 Card from Design with Heart and of course, the marshmallows are from 240 Sweet. Ahhh. Lady’s looking nice and cozy this week, ready to drink that tea and eat those pumpkin spice marshmallows fireside. 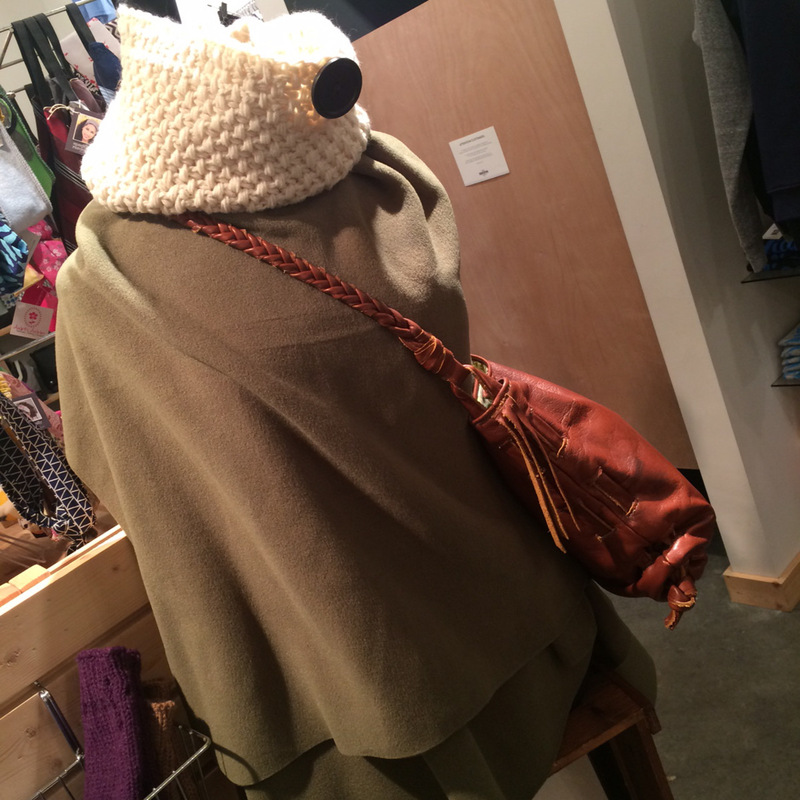 Cowl by Lindsay Streem Designs, The Cloque, and bag from ReFind Originals. 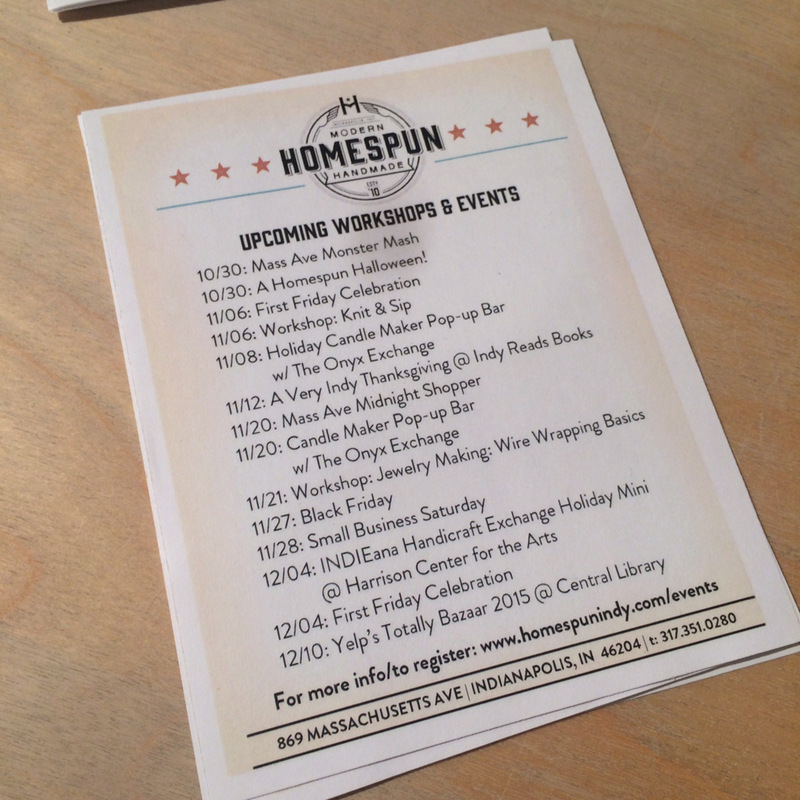 We’ve got these handy dandy hand outs for you at the register so you can remember all the awesomeness happening over here at Homespun this season! See below for details. Mass Ave Monster Mash: Friday, October 30th, 4-7pm: Join us for family-friendly trick-or-treating all along Mass Ave. Businesses up and down the avenue will be handing out treats on this night before Halloween. This event is FREE – just look for business displaying the orange Monster Mash signs between the 300 and 900 blocks of Mass Ave. We can’t wait to see all the little ghouls and goblins in their costumes! Holiday Candle Maker Pop-Up Bar w/ The Onyx Exchange: Sunday, November 8th, 11am-6pm: join the Onyx Exchange for an afternoon of candle making at Homespun! Mark your calendars and stop in to make your very own 7oz. Lux candle or 10oz. Wine Bottle Candle. Mix your own scents (36 to choose from!) and create a one-of-a-kind candle. These make great holiday gifts! A Very Indy Thanksgiving: Thursday, November 12th, 5:30-7pm: Join us at Indy Reads Books for an evening of Thanksgiving table talk. Corrie Quinn of Goose the Market will talk turkey. Regina Mehallick of R Bistro will be on hand discussing her approach to Thanksgiving sides. Lisa Cunningham of Mass Ave Wine will discuss the best wine pairings. 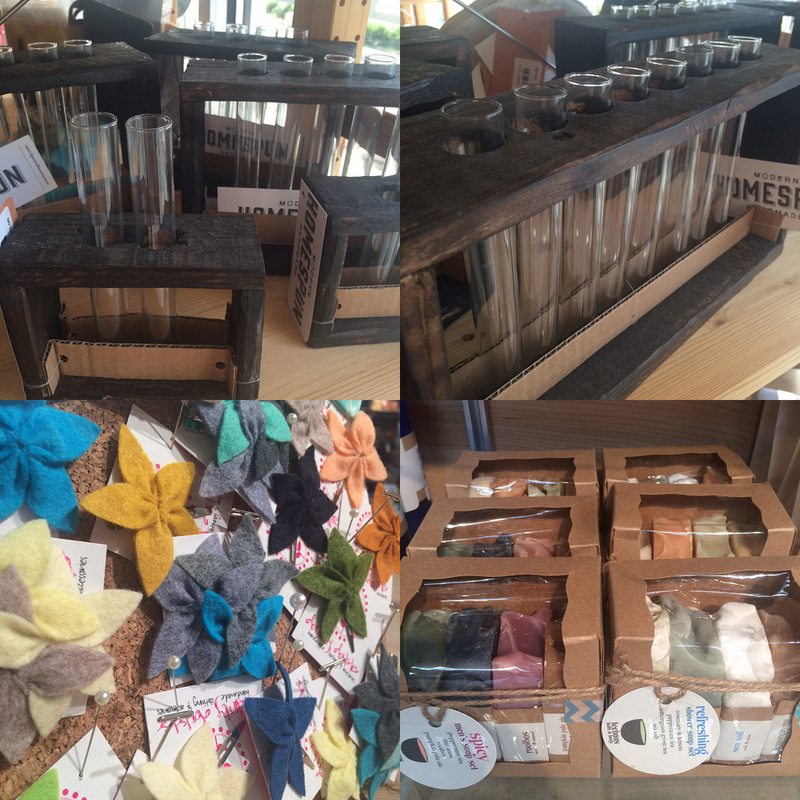 Last, but not least, Homespun will bring tablescape inspiration, with a dash of DIY. We’ll round out the evening with a Q & A session for our contributors, and one lucky attendee with win a sweet raffle prize! 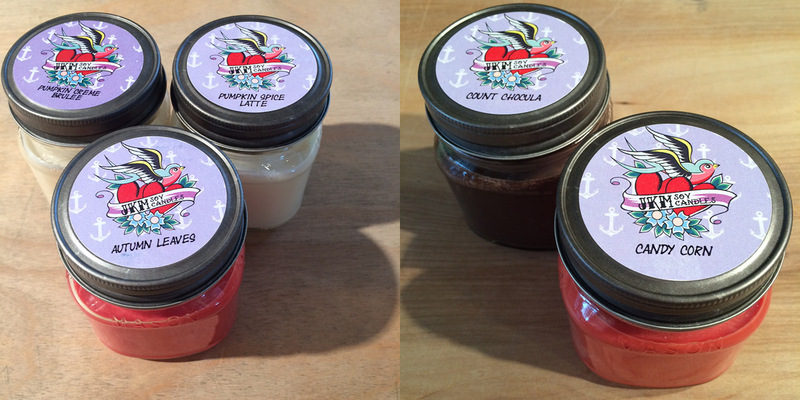 Candle Maker Pop-Up Bar w/ The Onyx Exchange: Friday, November 20th, 5-11:55pm: Join us for a special Candle Maker Pop-up Bar with The Onyx Exchange during Mass Ave Midnight Shopper! Stop in and create a unique 7oz. Lux Candle or 10oz. Wine Bottle Candle, for you or for a lucky gift recipient! Mix your own scents (36 to choose from!) and create a one-of-a-kind candle. These make great holiday gifts! Workshop: Jewelry Making: Wire Wrapping Basics: Saturday, November 21st, 4-7pm: It’s nearly the season of giving, and this jewelry workshop will kill three birds with one stone: give yourself the gift of DIY jewelry skills, then give yourself and a friend a unique, handmade gemstone piece! 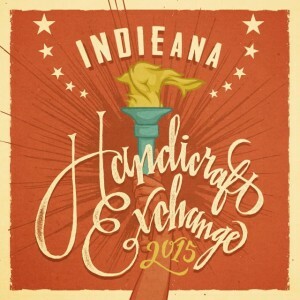 INDIEana Handicraft Exchange Holiday Mini: Friday, December 4th, 5-10pm: Our final INDIEana Handicraft Exchange event of 2015 will be held on Friday, December 4 from 5pm-10pm at the Harrison Center for the Arts in conjunction with First Friday and their annual color-themed show. Be everyone’s favorite gift-giver: come shop from over 50 vendors and snag a unique, handmade gift for everyone on your list, all while supporting independent businesses. Everyone wins! Monument Circle Art Fair: Saturday, October 10th, 10am-5pm: Indiana artists showcase their work on the momument in downtown Indianapolis. Free! German Fest at The Athenaeum: Saturday, October 10th, 12pm: A day- long, indoor/outdoor festival that celebrates all things German. Heartland Film Festival: Friday, October 16th- Sunday, October 25th: Every October, the Heartland Film Festival gives its moviegoers access to more than 100 visiting independent filmmakers from all over the world, right in the heart of the Midwest. Heartland showcases more than 130 entertaining movies that do more than just entertain over 10 days of red carpet premieres and events, parties and hundreds of film screenings across Indianapolis. Dia De Los Muertos at The Eiteljorg: Saturday, October 31st, 11am-5pm: The Eiteljorg is offering FREE admission to experience Día de los Muertos/Day of the Dead with partner, Nopal Cultural (an Indianapolis Latino arts and culture organization). See traditional papel picado, the cut paper decorations hung for Hispanic celebrations and get ideas for your own memorial by seeing the elements on the community ofrenda (offering place). Watch performances, meet artists in residence, explore artwork and a variety of altars, browse the marketplace and create art. Mass Ave Midnight Shopper: Friday, November 20th, 5-11:55pm: Tonight’s the perfect night to get a jump start on your holiday shopping! Many Mass Ave merchants will be open until midnight to allow prudent patrons a chance to enjoy all of Indy’s best shops and boutiques. 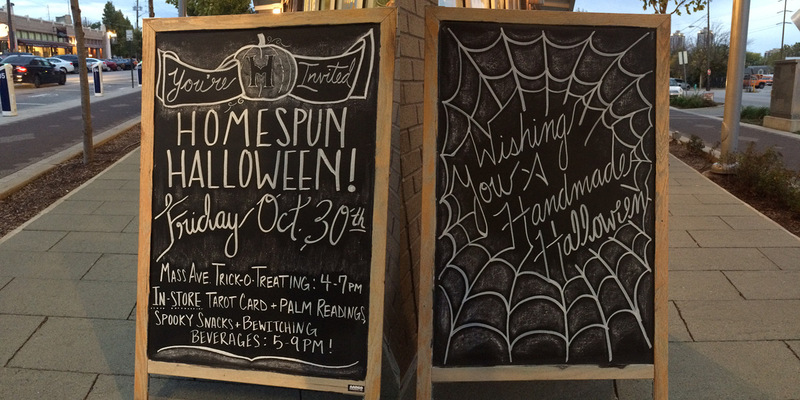 Homespun loves Halloween! We have lots of spooky activities here at the shop to celebrate. We’re listing them all for you here, as well as providing you with a little halloween eye-candy in the form of our spookiest products. 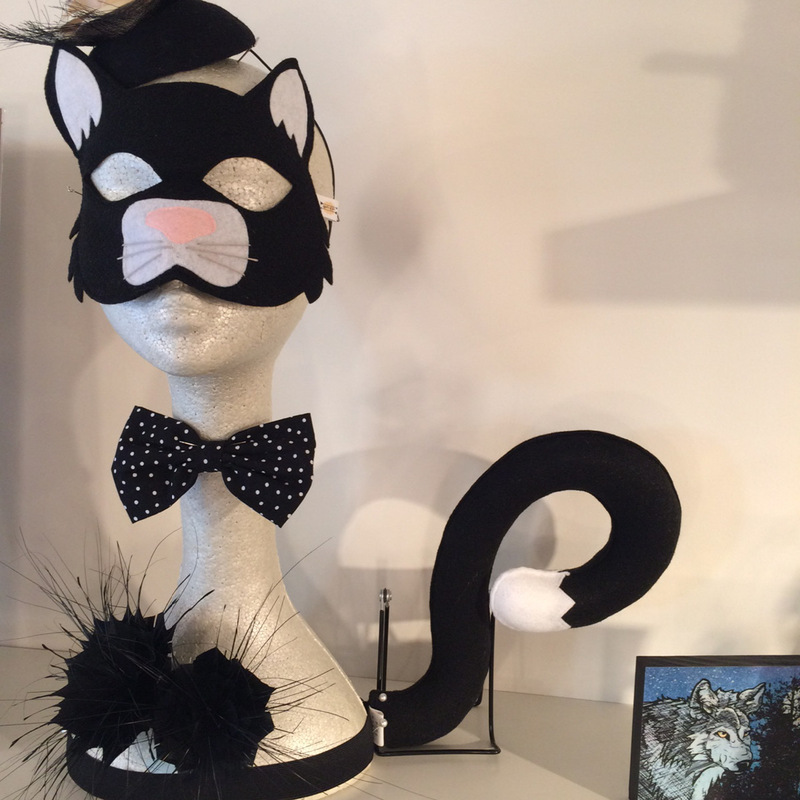 We have the best little felt masks and accessories for a classy costume by Opposite of Far. Fascinator and hair flowers by Hatcraft Studio and bowtie by Lila Barn. 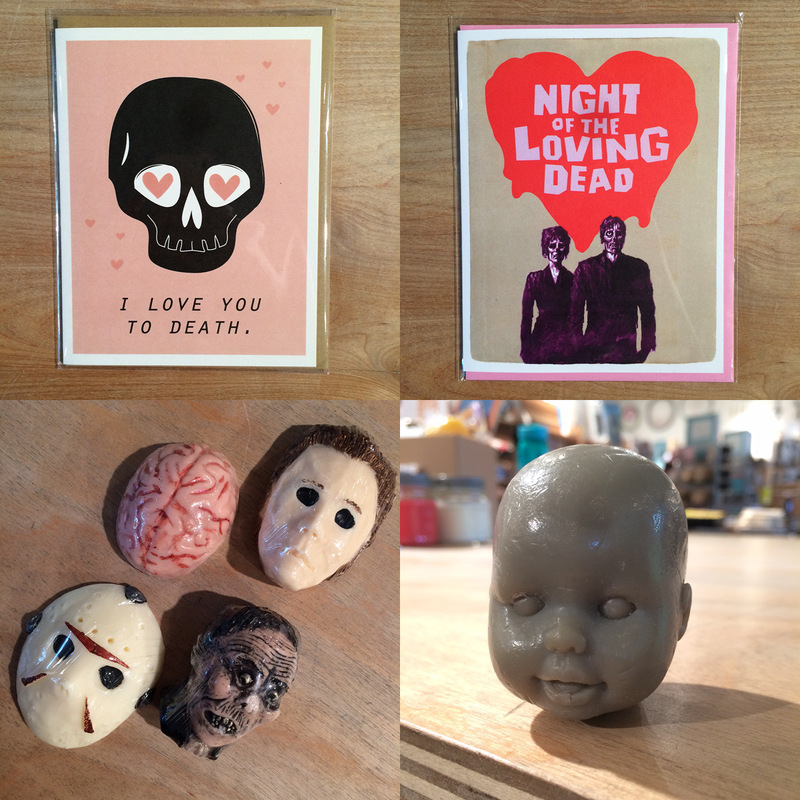 From greeting cards to art prints, we’re dying to show you what we have in stock. Pictured here, cards by Boxberry and Alternate Histories, soaps by Stinkybomb. 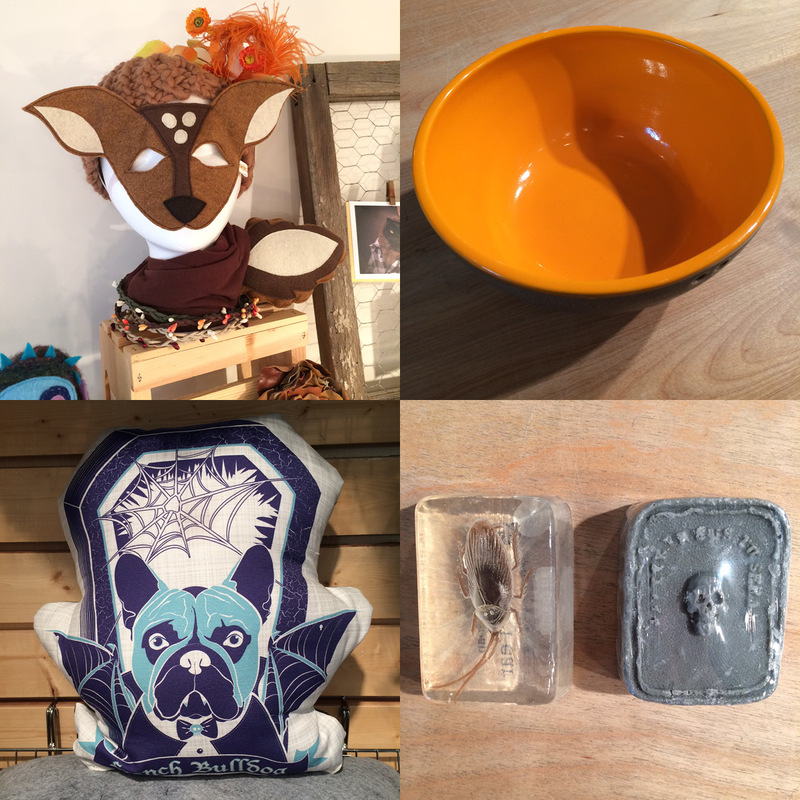 Sweet felt fox mask and tail by Opposite of Far, bowl by NStar Studio, French Bulldog pillow by PerPETually Yours and more creepy soaps by Stinkybomb. JKM is the master of candle scents and they do not disappoint with their fall line, including Pumpkin Creme Brûlée, Pumpkin Spice Latte, Autumn Leaves, Count Chocula, Candy Corn, Pumpkin Crunch Cake, Vanilla Pumpkin, Witching Hour, Love Your Guts, and Blood of the Undead. Come sniff them all! 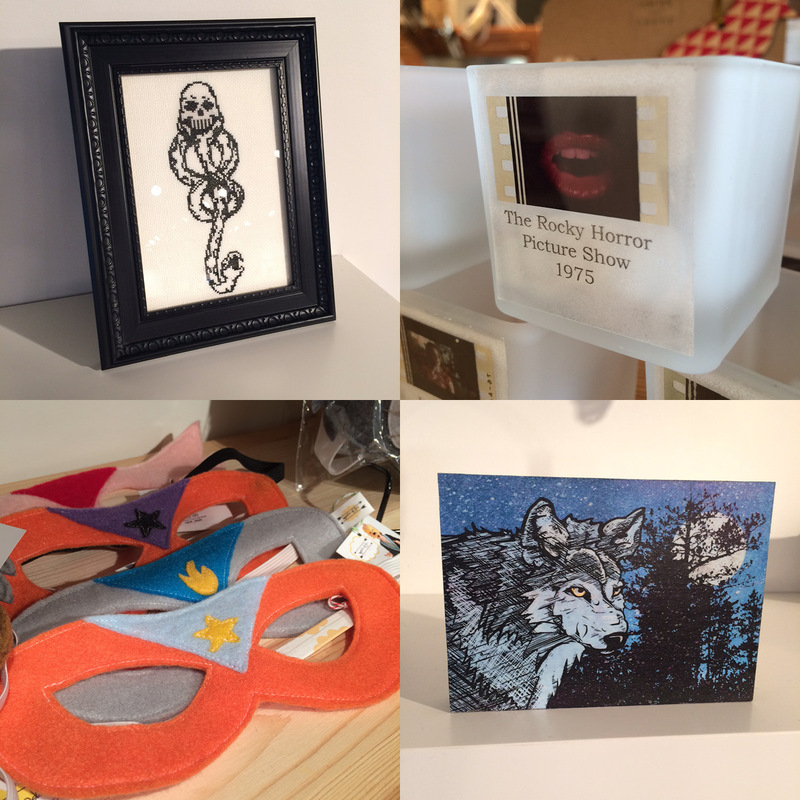 Needlepoint by Bombastitch, actual film cell candle votive from Rocky Horror Picture Show by Actual Film Cell Votives, superhero masks by Opposite of Far, and art block by Two Little Fruits. 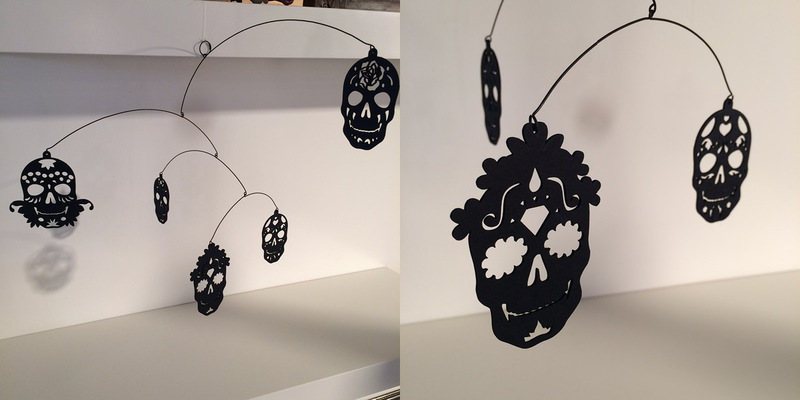 Dia de los Muertos- mobile by Sweet and Salty Designs. And now, the event line-up for the great Handmade Halloween! The many lovely shops on Mass Ave. will be hosting the annual Monster Mash on Friday, October 30th from 4-7pm. Come by and trick yourself a treat from us! We’ll also offer in-store tarot card and palm readings, and from 5-9pm munch on some spooky snacks and bewitching beverages! Rana from Salame Jewelry Designs will also be her conjuring up some custom quartz jewelry. 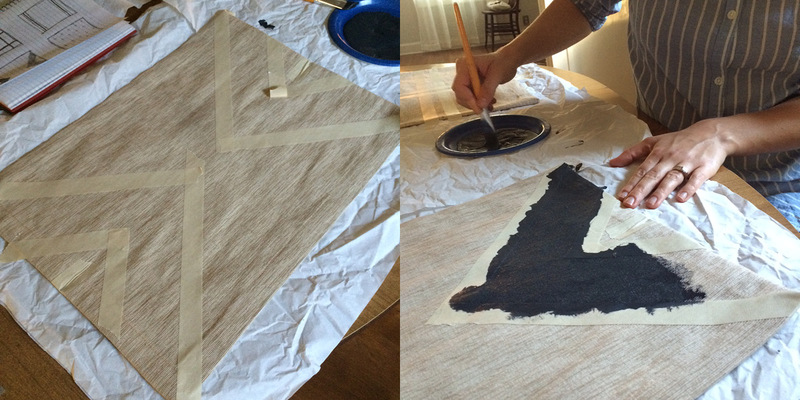 Our staff is also hard at work on our costumes for this year’s staff costume contest! Stay tuned to our social media pages (@homespunindy) where you will be able to vote for your favorite and have a chance to win a special prize! Workshop: Knit & Sip with Irmgard Burford: Friday, October 23rd, 6-8:30pm: In this workshop, students will learn basic knitting terminology, how to cast on, how to create a knit stitch, how to create a purl stitch, and how to bind off. Skills covered will be appropriate for beginner level knitters; however, more experienced knitters are welcome to bring projects to discuss with the instructor. All supplies, including needles, and yarn, will be included. Students are asked to bring a drink to sip (BYO beer or wine if you’d like to this private event). Workshop: Knit & Sip with Irmgard Burford: Friday, November 6th, 6-8:30pm: In this workshop, students will learn basic knitting terminology, how to cast on, how to create a knit stitch, how to create a purl stitch, and how to bind off. Skills covered will be appropriate for beginner level knitters; however, more experienced knitters are welcome to bring projects to discuss with the instructor. All supplies, including needles, and yarn, will be included. Students are asked to bring a drink to sip (BYO beer or wine if you’d like to this private event). This month we’re talking to Jon Weed, owner and creator of one of our most popular items here at Homespun: B. 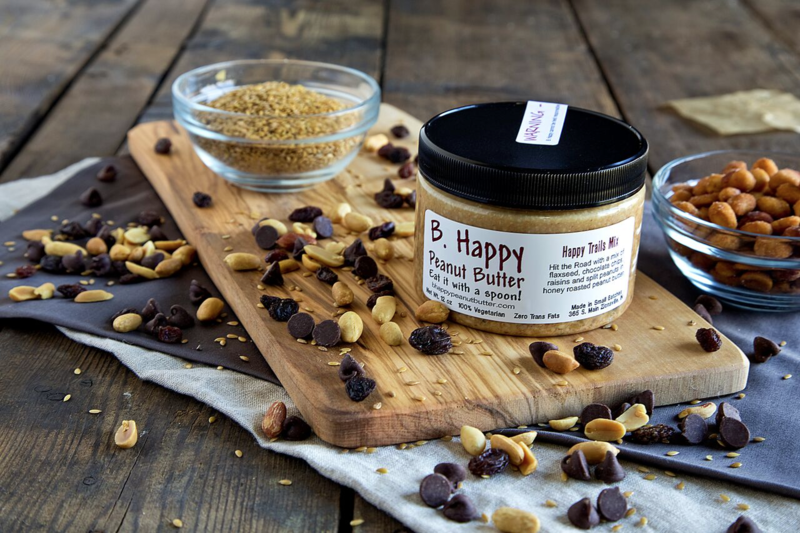 Happy Peanut Butter! Their delicious peanut butter took our shelves by storm and we just can’t seem to keep it in stock. Once you have a sample (ask us for one) you’ll understand why. It’s just not like any other peanut butter you’ve ever had. 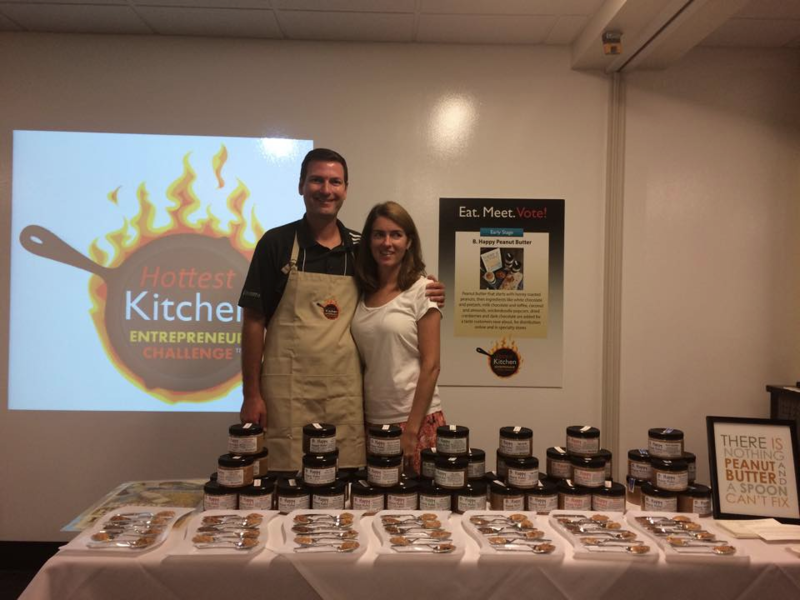 Not only does this company make an irresistible product, they’re a family business built with love. Learn more about their operation below and don’t forget to stop in and try some! Introduce yourself! What do you do and where? Hi There! I’m Jon Weed, the owner and creator of B. Happy Peanut Butter. 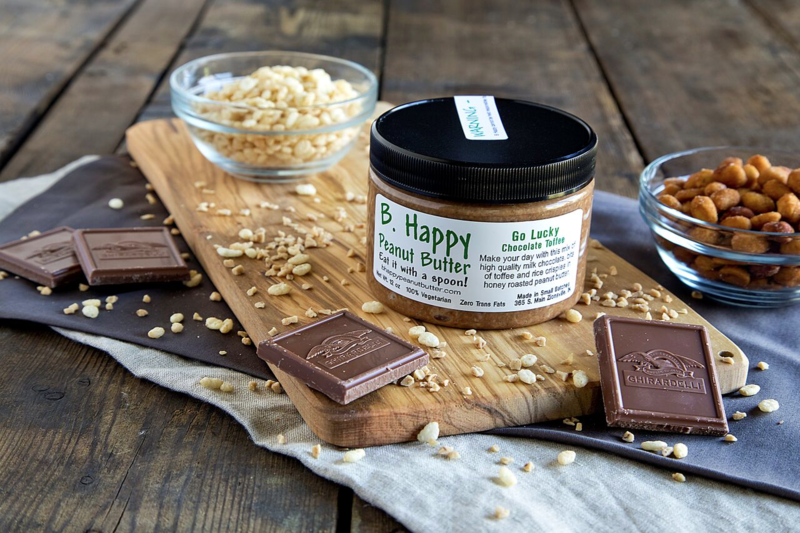 Along with my family (wife-Kathy, Jackson -16, Julia -14, Sawyer -10), we create unique small batch peanut butters that we think are so good, so addictive that our motto is “Eat it with a spoon!” We live in Zionsville, IN and have our commercial kitchen there also. How and when did you get started making peanut butter? Although my dad worked for Ford for 33 years and my mom was a stay-at-home mom, both had a very entrepreneurial spirit to them when I was growing up. I’m a big believer in “The American Dream” and nothing represents that better than the small business owner. I always enjoy seeing how other business owner do things and we are so lucky to be in a community where business owners really support each other. Describe the process of making your peanut butters. I don’t want to give away too much, but we have found the perfect honey roasted peanuts that we grind ourselves and, after many trials and errors, we think we have found great combinations of ingredients to mix in. 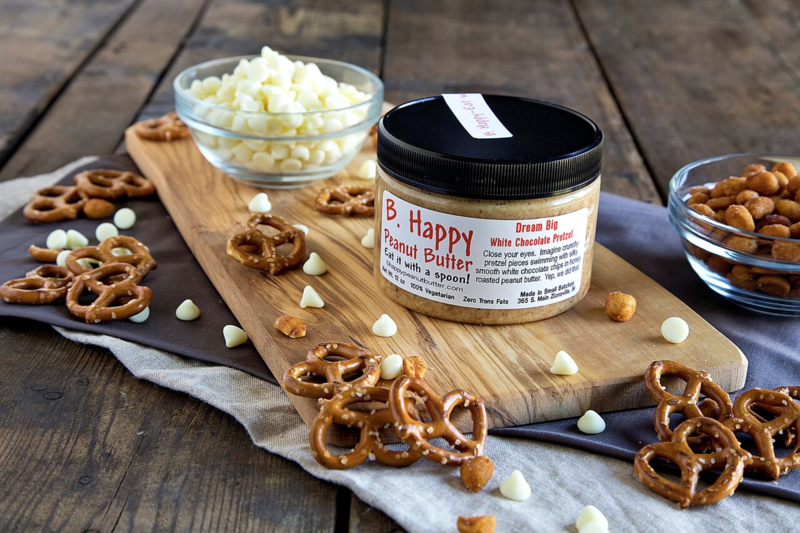 White chocolate and pretzels in our Dream Big, chocolate/toffee in our Go Lucky, Snickerdoodle popcorn in our So Happy Together, coconut/almonds/dark chocolate in our Don’t Worry, cranberries/white and dark chocolate in our Joy To The World, apple/cinnamon in our Pay It Forward, raisins/flaxseed/chocolate chip in our Happy Trails Mix and our plain one called KeeP Smunchy, because the texture is somewhere between smooth and crunchy. My “real” job is as a financial advisor, so I do that during the day, but nights, early mornings and weekends are spent making B. Happy in our own commercial kitchen that we started leasing a year ago. My wife, Kathy, spends part of her day jarring the B. Happy, making deliveries and shipping it out to our online customers. The kids help at night jarring, labeling and helping me make it. It truly is a FAMILY business!! What makes your peanut butter special? Besides the unique flavors, the main difference is the texture and the honey roasted peanuts. The honey roasted peanuts give it a great flavor and the texture is what we call smunchy, between smooth and crunchy. The smunchy texture allows it to be easily eaten with a spoon and we do not have a lot of oil separation because of the texture and the high quality peanut oil that we use. We hear the word “addictive” from a lot of our customers, so we are proud to have created a world of B. Happy Addicts. Besides the hundreds of plates, pictures and Christmas ornaments from my kids, my favorite handmade items are some pieces of artwork we have in our home. A great painting of Mackinac Island from an artist friend of mine and a painting of the first home I bought in Broad Ripple. I hope that people know how much we appreciate the positive feedback we get about our B. Happy. There are a lot of late nights of work along with tough decisions of balancing family and work, but to get to hear or read about how much people LOVE our product makes up for all of it. As I am always saying to people that tell us that, “I never get tired of hearing those words.” Please keep it coming! Raising kids that I think appreciate what they have and are kind people. It helps that they see what hard work looks like and that they earn their own money. We don’t give our kids a weekly allowance, so what they spend is from what they earn and that means they have to make some tough decisions, which I think is good. It’s not an “achievement,” but I’m blessed to be married to someone that I still love this much after almost 23 years of being together. 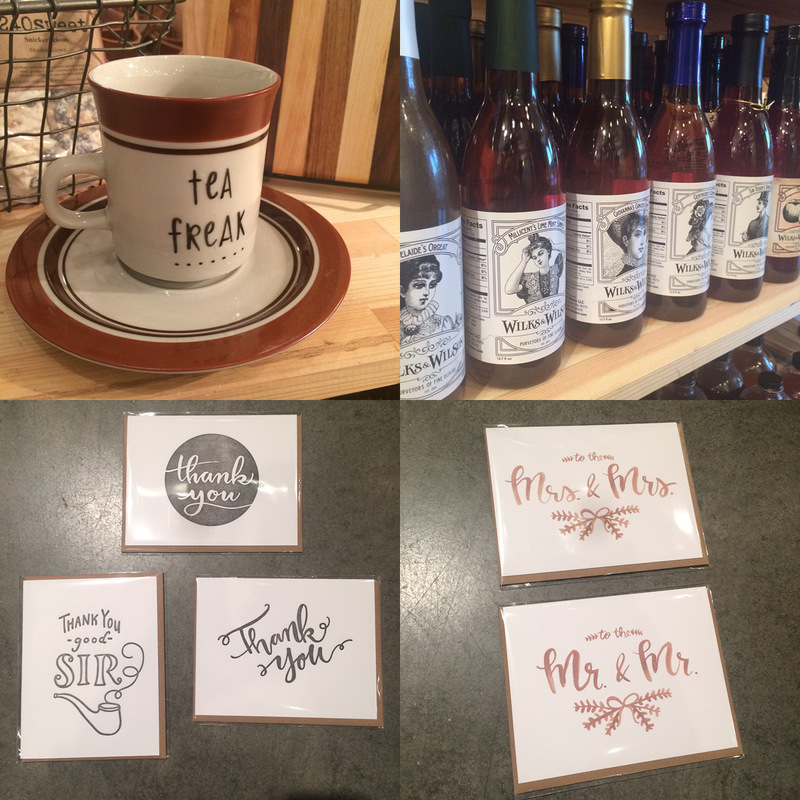 I have really enjoyed getting to know the business owners of the stores that sell our B. Happy. These people work so hard and take so much risk to do what they do and I hope that our B. Happy makes all of their stores a better place. They are trying to live their “American Dream” and I just respect the heck out of them for doing that. I also love sending a positive message through our B. Happy. Kathy would tell you that that is my life motto (Be Happy) and I’m glad to share that with our fans and addicts. Life is Short – B. Happy!! Beautiful new things coming in our doors this week including products, people, and that warm October breeze. 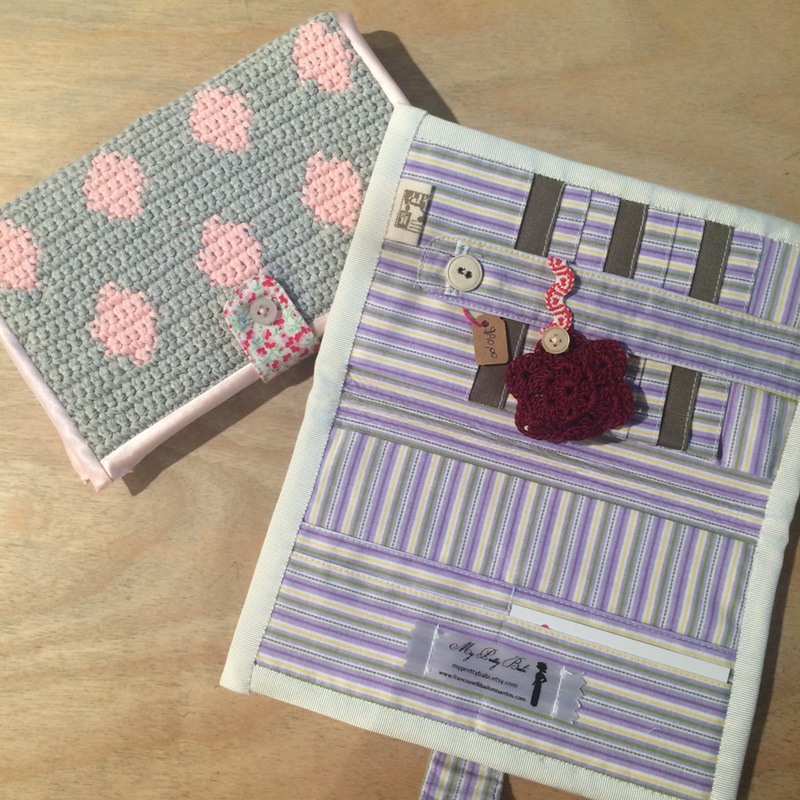 Wallets from My Pretty Babi made in Indianapolis. 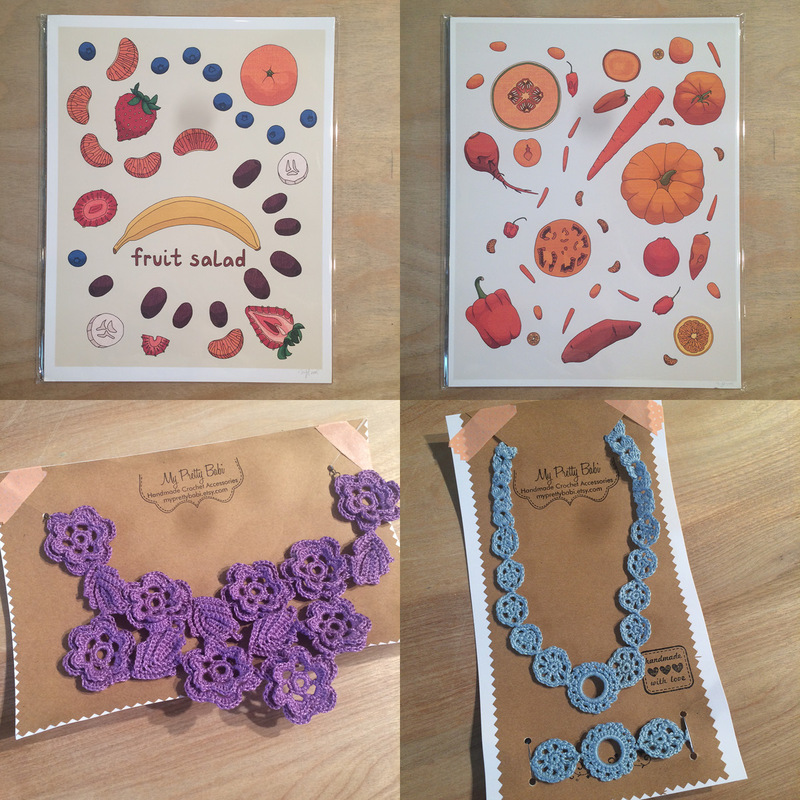 Prints (plus so much more in the shop) from Artfood Collective and necklaces also from My Pretty Babi. 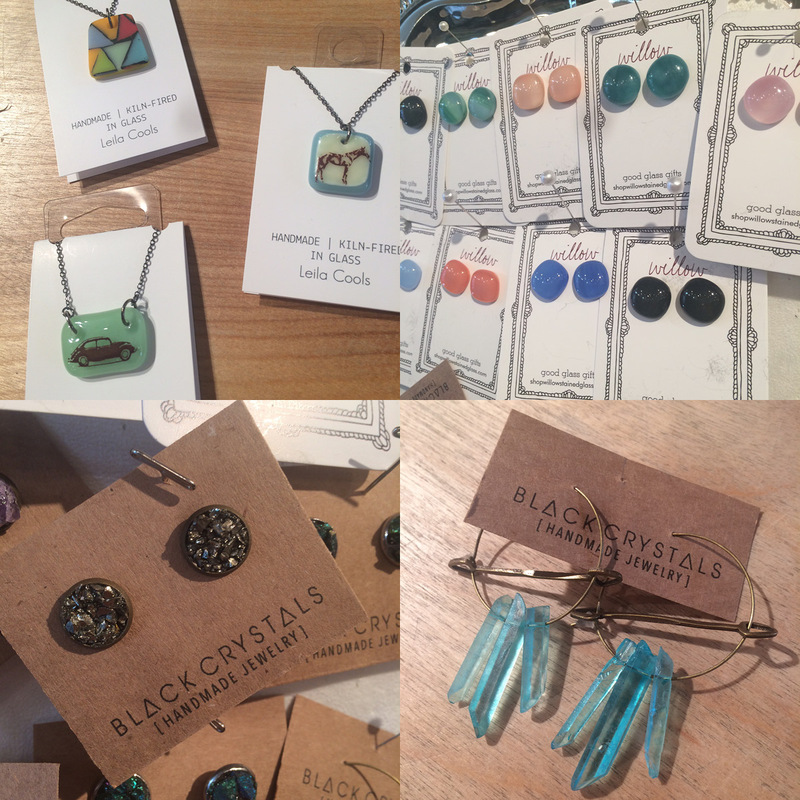 New glass necklaces by Leila Cools, large colored glass studs from Willow Stained Glass, and new earrings by Black Crystals. A brand new item from a brand new vendor; An Squared brought us these test tube vases. We’ve also received a restock on these beautiful felt flower hair pins by Dainty Daises and new gift sets by Teehaus Bath & Body. Geometric tea towels by Moko & Co., and An Squared also brought us these really sweet chalkboard/ cute card you got from Homespun display combos! 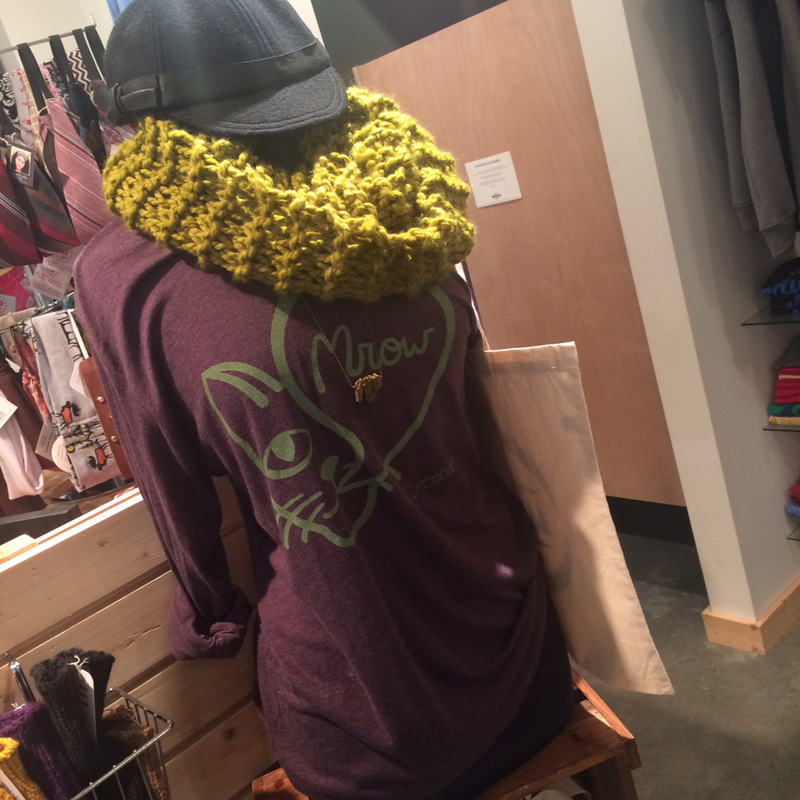 Lady lookin’ good in her shirt by Scobar, necklace by Grey Theory Mill, cowl by Jo Designs, hat by Savage Millenry and tote by Kin Shop Goods. 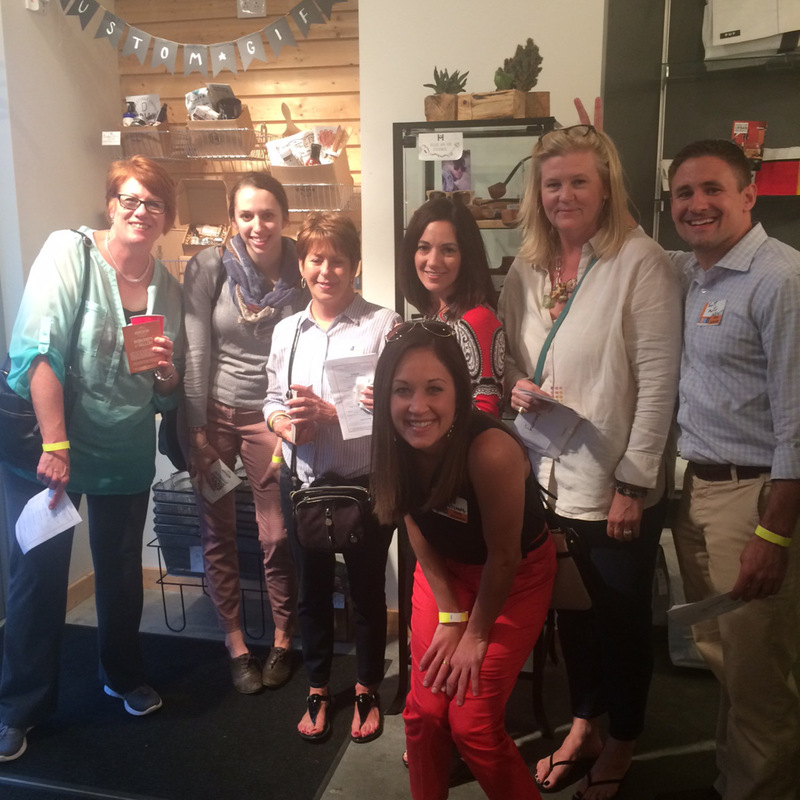 The Interior Design Coalition of Indiana made Homespun its beginning stop on their scavenger hunt! A very spirited and fun crew, thanks for visiting!